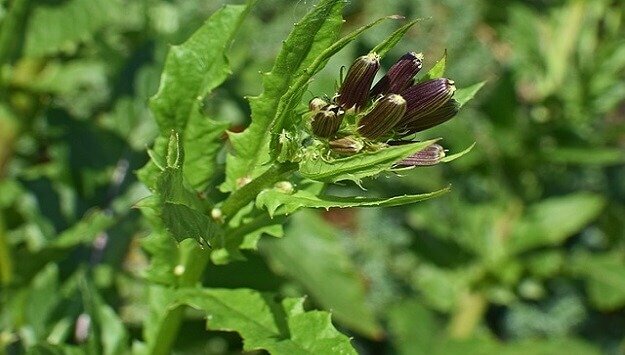 As the days grow longer and summer approaches, you may have noticed that some of your garden crops have a tendency to stop growing or putting on new leaves, and bloom and go to seed, or “bolt.” This is most common among leafy greens such as lettuce and arugula, or brassicas like kale and collards, but it may happen with other plants as well, such as root crops like turnips or radishes and carrots. If you’ve ever wondered what causes this sudden change, there are a few different factors that can cause bolting. One of the most important is temperature (particularly soil temperature), and the other is day length. For many leafy greens, warm soil means the end of the growing season, which means it’s time to send up their flower stalks and devote their remaining energy to setting seeds. During this period, their leaves often become bitter or tough. Day length…plays an interesting role in the lives of some plants. The phenomenon known as “photoperiodism” dictates which plants bloom at different times of the year. Many plants use a protein in their tissues to detect changes in the number of hours of darkness in each 24-hour period. As nights grow shorter in late spring and early summer, the flowering process is triggered. Plants that fall into this category are called Long-day Plants, and include oats, clover, peas, barley, lettuce, turnips, and many others. Short-day Plants have the flowering process triggered by the arrival of increasing hours of darkness, so they typically flower after the summer solstice. Plants in this category include tobacco, chrysanthemums, rice, and others. Yet another category of Day-neutral Plants exists (including cucumbers and tomatoes) that bloom regardless of the day length. These plants tend to bloom once they reach a certain stage of maturity, and because of this, they simply don’t bolt. Onions have the curious distinction of coming in both Long-day and Short-day varieties. Day length triggers bulb formation in onions. Long-day onions need a day length of 14-16 hours in order to trigger the bulbing process in summer, whereas Short-day varieties bulb up when the day length is 12-14 hours. This is an important consideration for growers, and relates to the latitude at which they are grown. In…the northern half of North America, we grow Long-day onions. Down in Georgia, where masses of onions are farmed, they grow Short-day types. Other factors that can cause plants to bolt can include drought, sharp temperature swings, root disturbance such as transplanting, or anything else that puts extra stress on the plants. Some crop varieties are bred to resist bolting and these may remain edible later into the warmer months; if your lettuce bolts early, look for “bolt-resistant” varieties for next year’s spring salad garden.